As in raising our children, one of the most important concerns for Julie (the primary farmer) has been providing adequate nutrition. That has only gotten stronger over the years. For the last ten years she has been taking a fall soil test (she feels that laboratories like Logan Labs, which use the protocols de-veloped by William Albrecht, are the gold standard for soil testing) and using that as the basis for what to put down the next year. She consults with our son Dan to better understand the test and make recommendations based upon it. But Rawson does not rely on purchased products for all of her inputs – she also tries ideas picked up from other farmers. At a recent conference Maine’s Mark Fulford suggested using water from fermented weeds as an activator. Julie is trying this out and leads me to her many pails stuffed with plants soaking in brownish water. One of the traits which distinguishes our farm from many area organic farms is the presence of a significant number of livestock and poultry. Besides lik-ing to eat meat and eggs that we know are from humanely raised and healthily fed creatures, Julie believes in integrating plants and animals in much the same way that nature does. “One of the things that we have been trying to perfect,” she explains, “is how to best utilize the animals we have here — we raise 300 meat chickens a year plus adding a hundred new layers each year. We also have two cows, 9 pigs and up to a hundred turkeys. When putting animals on a field Rawson tries to replicate the ideas that have been popularized by Alan Savory concerning intensive but short periods of grazing followed by rest to allow the pasture to regrow, often called ‘mobstocking’. In 2015, for the first time ever, Rawson took one of the main vegetable growing areas out of production in order to fully bring in the benefits of livestock and poultry and long term cover crops. The results of Julie’s planned ‘Rest & Rehabilitation’ for the West Field have been more than she hoped for. This last year, because of her concern about carbon and weather etremes, Julie has experimented with various ways of practicing little or no tillage. It is way too early for her to draw conclusions, but she thinks some of these methods show real promise and says the farming year was quite successful. Despite the worst drought central Massachusetts has experienced in our 34 years of growing, it was one of our most productive years. Both crop yield and crop quality were high. Wood chips are one of the major innovations Rawson introduced to the farm this year. Our local Department of Public Works collects them from land-scapers and makes them available gratis, loaded into your pickup, to anyone in town who can use them. Julie hired a dump truck and we ended up taking 13 loads this spring. She finds that they are excellent as a mulch and can be applied for many crops even before planting. “We tried planting through cardboard and wood chips this year,” she explains. “When we planted transplants, we used string to mark our beds and pathways and just dug a hole in the bed through the chips and planted our tomatoes or brassicas. In one instance we planted cucumbers and carrot, seeds in beds that had been mulched with chips for an earlier crop of onions. We drew a pathway and shallow furrow through the chips -– probably an inch deep — with a hoe and planted the seeds in that and covered them back up with dirt. There was a challenge with wood chips falling into the furrow until we learned how far to pull them back – probably 3 inches or so for cucumber seeds. If we are doing something like carrots, however, which we do as 4 rows equidistant in the bed, we found retrospectively that it was better to rake all the chips off the bed first. Germination was not good when we didn’t completely remove them from the bed. Another innovation we tried was massive coverage of soil in the fall with cardboard. Julie and I located the merchants in town last year who went through large amounts of big corrugated boxes (think dealers of motor cycles, stoves, refrigerators, replacement windows and doors) received their blessings for scheduled raids upon their dumpsters, and brought home truckloads of the stuff which were then laid out over one-half of an acre of field from November through March. On top of that we would often pile truckloads of oak leaves just scavenged from edges of the scenic, tree-lined road on which we live. The cardboard didn’t break down over the winter and spring as much as Julie hoped, in part because of the lack of precipitation. Although she mostly planted through the cardboard, in one section of the field she pulled off the cardboard and hay, poked holes every 18 to 24 inches, and planted transplants into the dirt. But she didn’t till. She recalls that worms just filled the area under the carqboard, lying side by side. “I felt a clodiness to the soil,” she says, “that reminded me of growing up in Illinois — clods the size of my hand, cracks in the soil. It was a different struc-ture than I’m used to here. I finally realized after talking to NRCS people that those clods are a good thing. That bore out in the crops we got here. What I noticed when we planted things here is that they immediately took off, they were dark, beautiful green from the start. That was the second week in June. “Cardboard works very well to attract earthworms into the system,” she asserts. “I’m not sure why – they must be eating the cardboard or microbes are doing that and the worms are eating them. Also you can see daikon here and there. These are nicely formed plants that have a cohesive structure. The soybeans here were meaty, the summer squash quality and consistency was strong and resulted in a huge amount of production for a long period of time. I’d never had that kind of consistency. Things last longer when raised this way. Here are tomatoes that we didn’t pick last night. Looks like these made it through the frost. These were mammoth plants and we didn’t start getting early blight until about the fourth week in September. Despite all these wonders, Julie is not planning on laying out massive amounts of cardboard this winter. One interesting lesson so far that Rawson is taking to heart is that despite all her fertility amendments and other good management practices, although her first crop in an area does well, replants in a bed that has been tilled do not hold that quality for the next crop. Julie is not sure why areas that have been no-tilled look so much better, but figures that those that have been tilled don’t have as much microbial activity in the soil, particularly less fungal activity. A major problem that no-till presents is having to change the way you plant. That is part of the work that Many Hands Organic Farm is hoping to address next year. 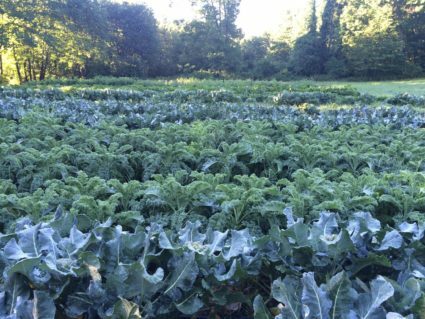 These brassicas were planted without tillage into our West Field, covered over last winter in cardboard and mulched with wood chips. Besides reducing tillage, the other carbon-building practice Julie has had a lot of success with is use of cocktail cover crops. Although 2016 was a bad year for drought and cover crops sometimes had difficulty germinating, their use seemed to augment crop production. “We planted cucumbers in our small hoophouse in the spring,” she says. “When they were up adequately we broadcast an annual cover crop mix. The cucumbers were mulched with hay and woodchips and the annual cover crop mix was broadcast onto the mulch. The cucumbers that were here had the longest life of any of our cucumbers on the farm. Julie’s interest in cover crops resulted in MHOF being the site of a cover crop workshop attended by 50 or 60 people on July 25. She had taken a section of a field and planted it to 3, 6, 9, 12, 15 and 18-way cover crop mixes. Ray Archuleta and Brandon Smith came from NRCS, dug up soil samples, and showed attendees how to evaluate them. Ray was particularly pleased with our level of soil aggregation! The biggest problem with cover crop use in operations that specialize in annual vegetable crops is getting them to go away when their usefulness is done. Unless carefully managed, perennial cover crops can overwhelm and crowd out crops planted into them. The primary ways cover crops are disabled without tillage are by winter killing (for annuals), by rolling over them with a heavy tractor-drawn ‘roll-er-crimper’ which is supposed to knock them down and crimp their stems so that sap can no longer flow up and down, effectively killing them, or by mowing. The latter two systems are far more effective if the cover crop is at the ‘milk stage’ where its energy has shifted from vegetative growth to seed growth. That way the plant is less likely to have the strength to repair damage inflicted by crimping or mowing which does not succeed in actually killing the plant. The risk, however, is that unless done in a timely manner, the plant will get to the stage of setting seed, after which any practical management method guarantees widespread unwanted seed distribution — likely to lead to serious problems when the seed comes up. “Some people talk about crimping the cover crop and then planting right into that,” she says. “But we haven’t done that and I don’t know what tools could be used for that. I’m using what tools we have available to us. My understanding is that it is very difficult to kill rye unless it is ready to die! My so-lution for early crops is to plant where we have used cardboard, or use annual cover crops that will winterkill. “Vetch is another killer,” she continues, “like rye. It wraps around everything and chokes it to death where rye just muscles it out. But I like them because vetch fixes nitrogen and rye mines for minerals and builds incredible soil structure with its long roots. 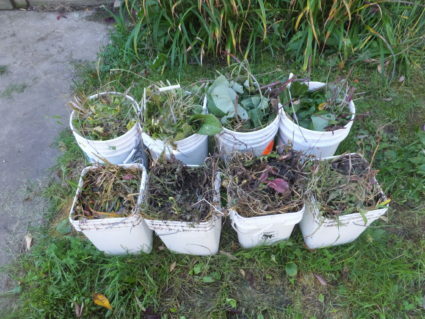 You can use nitrogen-fixing annuals like Austrian winter peas and many of the clovers in winter-kill cover mixes, but I like the soil building effect of the perennials so I’ll still use a lot of them. “If I plant perennial cover crops like rye and vetch,” she concludes, “which are the major aggressive ones I have used here, I have to be sure that the crops I want to plant there the next year are not early crops. You can maybe push it for us, in cold central Mass, if you are planning to plant something on June 1 you could raise rye there, maybe even June 15, and be assured that when you mow it and knock it down it is done growing. That will be the milk stage when all the energy is going into seed production and the stalks become brittle and it loses its vegetative strength. At that moment you can take it out and it won’t grow back. We don’t have a roller crimper to crush the cover crop, so what we do is mow it with a rotary mower. In some areas we did till in 2016 because we had put in rye for the winter and it was hard to kill in the spring. We wanted to use that soil when it was too early for the rye to reach its milk stage — when we could mow it and kill it. Her experiences with cover crops this year have taught Rawson a lot about management strategies. She feels next year she will be able to manage a lot better. 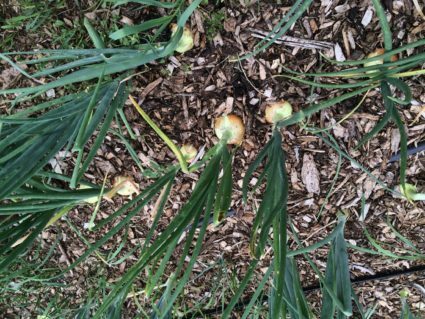 These Copra onions, one of our best crops ever, were planted as seedlings into a wood chip mulch after using broadforking of winter-killed cover crops as bed preparation. 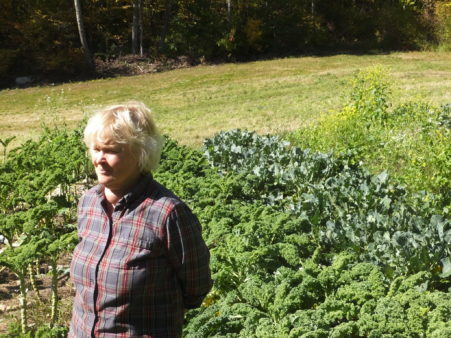 Julie is careful to maintain green, carbon producing pathways between her cropping beds. Generally she prefers clover for that purpose, because it doesn’t get too tall and as a legume fixes nitrogen from the atmosphere into the soil. There are some tricky issues in keeping pathways properly managed, howev-er. Rawson takes us to a pathway between a kale bed and a parsley bed. The kale is tall enough to shade the pathway, and when they harvest the parsley weeders go in advance of the cutters to ‘weed’ the pathway where it comes up to and over the edge of the parsley bed. She also uses green pathways between rows of perennials like rhubarb. Julie mulches the rhubarb itself with wood chips and old chicken bedding, and then lets the middle of the pathway grow up in grass that can be mowed. 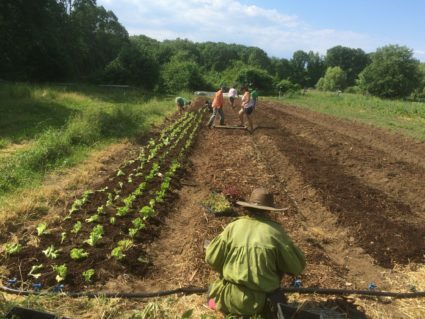 Lettuces are transplanted into a wood chip compost, in spots marked off by a 4’ x 4’ dibble, being pressed into bed in upper right. Note drip irrigation header in foreground. Bed prep included mowing and removing perennial cover crops in mid-June followed by one day of solarization. Outstanding high quality lettuce was harvested throughout July in 100˚ heat. Clover is also excellent undersown with tall crops like kale or chard. 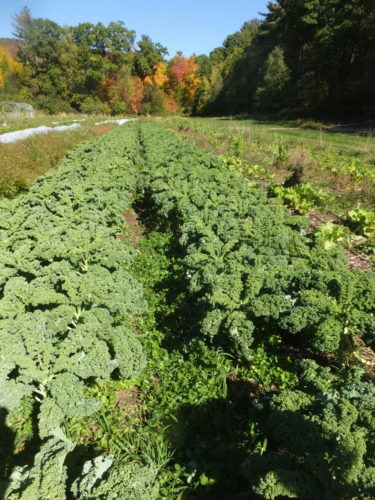 In one bed Julie planted chard in May, mulched it with cover crop residue, then broadcast clover on top of that mulch. In October she is still harvesting the chard, which has a lot of good color and taste. Water is obviously crucial to agriculture. That importance was accentuated at MHOF in 2016 because of the drought impacting much of central Massa-chusetts. But Rawson feels that the water problems at the farm – both from too much and too little – have been mitigated by the years of building soil carbon. 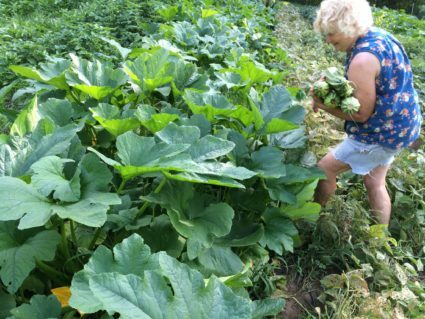 Julie harvests summer squash from giant plants in no-tilled West Field. Rawson is constantly looking at the root structure of her crops and the soil’s texture and color. Although mostly a practical farmer, Rawson is planning a small 4-way trial next year to compare various farming practices. She has selected an un-cropped area which has grown up with perennial grasses and weeds. “We’re going to mow it and divide it into 4 equal sections,” she says. “The first one we’ll till this fall, and try to kill the sod, then come back and till 6 weeks later. Then we will leave it for the winter. Next spring we will plant a crop here. The second bed we will cover this fall with cardboard and put leaves and hay on top of that, and try to kill the sod that way. The third bed we will solarize in the spring and then plant into it. The last bed we are going to cover with tarps and kill by shading (called ‘occultation’). We will use the same fertility, same spacing, and plant the same crop in each area. We’ll measure yield and look at insect damage and weigh stuff and take pictures. I think it is important for anyone to be as curious and creative as they have time for. Bring systems that work into your protocols and be tinkering with them to get improvement.